Take charge of yard debris with Toros PowerPlex BLDC Blower. This cordless, 40-volt MAX blower has the power to move debris and features needed to control for many different tasks. Its thoughtful design puts the variable speed trigger, speed lock, turbo boost close together for one-handed operation on a very well-balanced tool. Toro included blower components that allow for the easy attachment of the Toro gutter cleaning kit and a path-widening, oscillating nozzle kit. With 90 watt-hours, the T90 battery provides up to 60 minutes of run time and this battery charges in approximately 60 minutes in the quick charger. 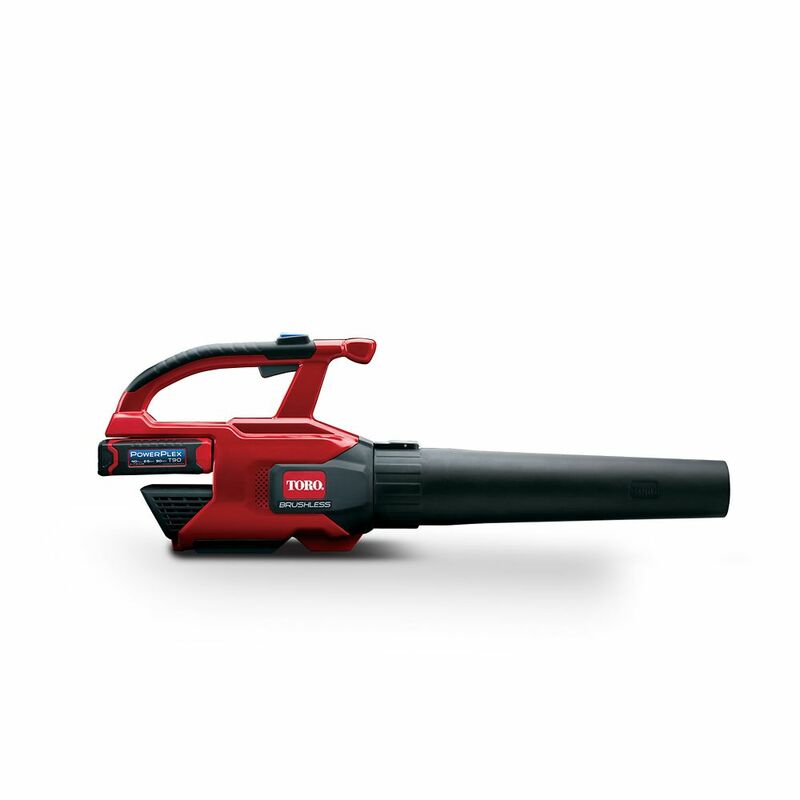 No other cordless blower offers this combination of versatility and power. Take charge of the yard with Toro PowerPlex tools. Turbo Boost Power with Speed Lock up to 480 CFM to move more faster - 20% more air volume (CFM) than its highest performing direct competitor. Speed Nozzle increases air speed to 150 MPH. Powered by a 58V lithium-ion rechargeable battery, the all-new Jonsered BP750i backpack blower is capable of incredible high-velocity air speeds up to 150 mph and airflow up to 750 cfm to easily handle the toughest blowing tasks like clearing wet, heavy leaves, grass, and other stubborn debris. The battery-powered, brushless motor provides the power, performance, and runtime typical of traditional gas-powered equipment - without the hassle of mixing and storing fuel or harmful emissions. Other impressive features include instant push-button starting with no pull cord, variable speed control, digital cruise control, and integrated power boost technology. It has an ambidextrous design that works for left or right-handed users, and also features a heavy-duty frame; contoured, adjustable shoulder straps; and padded, load-reducing harness for optimal fit, superior comfort, minimal strain, and reduced fatigue for users of any size. PowerPlex 150 MPH 480 CFM 40-Volt Max Lithium-Ion Cordless Brushless DC Leaf Blower Take charge of yard debris with Toros PowerPlex BLDC Blower. This cordless, 40-volt MAX blower has the power to move debris and features needed to control for many different tasks. Its thoughtful design puts the variable speed trigger, speed lock, turbo boost close together for one-handed operation on a very well-balanced tool. Toro included blower components that allow for the easy attachment of the Toro gutter cleaning kit and a path-widening, oscillating nozzle kit. With 90 watt-hours, the T90 battery provides up to 60 minutes of run time and this battery charges in approximately 60 minutes in the quick charger. No other cordless blower offers this combination of versatility and power. Take charge of the yard with Toro PowerPlex tools. PowerPlex 150 MPH 480 CFM 40-Volt Max Lithium-Ion Cordless Brushless DC Leaf Blower is rated 3.8 out of 5 by 114. Rated 5 out of 5 by Flowers from Super Fantastic...well worth the money... I tried other brands in the past...nothing compares to Toro. I highly recommend this product Two thumbs up! Rated 1 out of 5 by Tom419 from Does not last long I bought this a day ago and I have returned it. Has lots of power but the battery life is around 10 Min. or less even after a full charge. They advertise on the box that it last for 60 min. This did not happen. Rated 2 out of 5 by MrA1958 from Blower has great airflow Biggest problem is battery does not seen to hold a charge . May only run for 10 minutes after being charged . May end up returning product . Rated 1 out of 5 by Duke from They tell you the battery will last for one hour.... They tell you the battery will last for one hour. I only got 13 minutes on a full charge.In order to get more time you have to purchase an extra battery that can hold more juice.I returned the product. Will purchase another brand in a few weeks.